The insulation resistance test is often a compromise to. This test should be carried out at 500Vdc for most equipment, but some appliances may require a 250Vdc test. 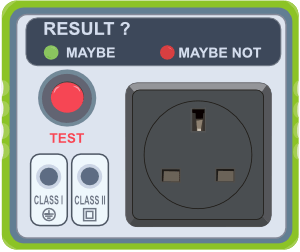 Some pass/fail PAT testers can only carry out a 500Vdc test, whilst others use an in between value such as 350Vdc. However one particular pass/fail tester uses a mere 9Vdc test voltage with a limit set to 1MΩ for both Class I and Class II equipment types! It’s clear that these machines are designed to be easy to use with little or no training, but unfortunately they will never carry out a test that meets the requirements of the IET Code of Practice. Some are better than others. One popular model has an option to set the earth continuity pass limit to either 0.25 Ω for shorter cables or 0.5Ω for longer cables, which seems a reasonable compromise. But a machine that has a limit of 10Ω and a test current of 2.3mA for earth continuity and a 9v insulation test is not a PAT tester. Spend a little more and you can get a PAT tester that will actually display the test reading as well as a pass or fail indication. In some cases the test instrument may indicate an incorrect result, but a trained user will be able to interpret the actual measured value.